In this article we explore the concept of Difference of Gaussians edge detection. This article implements image convolution as a means of achieving Gaussian blurring. All of the concepts explored are implemented by accessing and manipulating the raw pixel data exposed by an image, no GDI+ or conventional drawing code is required. The concepts explored in this article can be easily replicated by making use of the Sample Application, which forms part of the associated sample source code accompanying this article. When using the Difference Of Gaussians sample application you can specify a input/source image by clicking the Load Image button. The dropdown combobox towards the bottom middle part of the screen relates the various edge detection methods discussed. 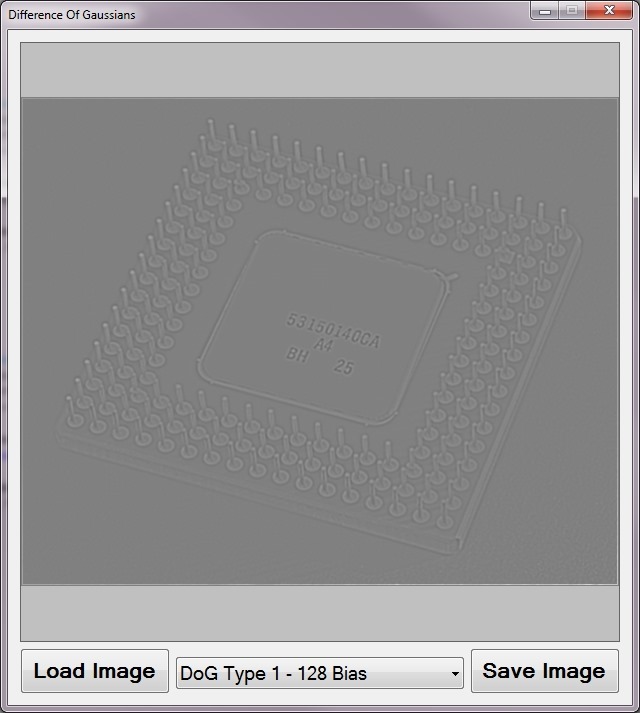 If desired a user can save the resulting edge detection image to the local file system by clicking the Save Image button. What is Difference of Gaussians? Difference of Gaussians, commonly abbreviated as DoG, is a method of implementing image edge detection. 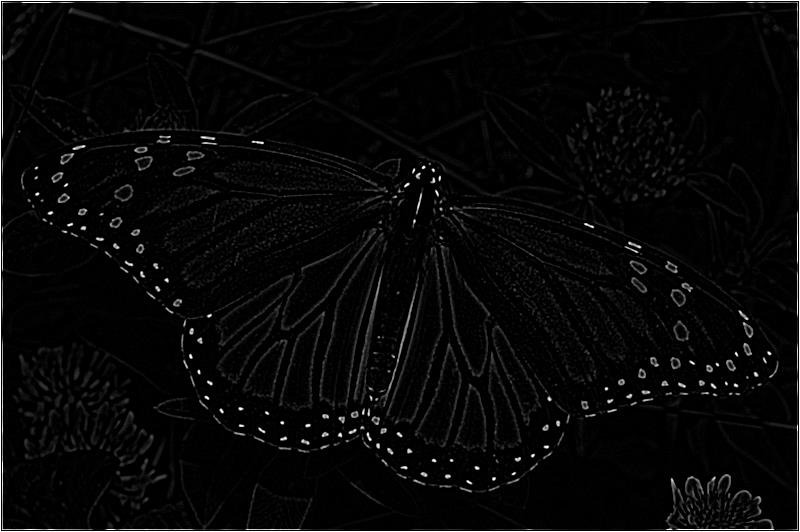 Central to the Difference of Gaussians method of edge detection is the application of Gaussian image blur. In imaging science, Difference of Gaussians is a feature enhancement algorithm that involves the subtraction of one blurred version of an original image from another, less blurred version of the original. In the simple case of grayscale images, the blurred images are obtained by convolving the original grayscale images with Gaussian kernels having differing standard deviations. Blurring an image using a Gaussian kernel suppresses only high-frequency spatial information. Subtracting one image from the other preserves spatial information that lies between the range of frequencies that are preserved in the two blurred images. Thus, the difference of Gaussians is a band-pass filter that discards all but a handful of spatial frequencies that are present in the original grayscale image. In simple terms Difference of Gaussians can be implemented by applying two Gaussian blurs of different intensity levels to the same source image. The resulting image is then created by subtracting the two images of different Gaussian blurring. 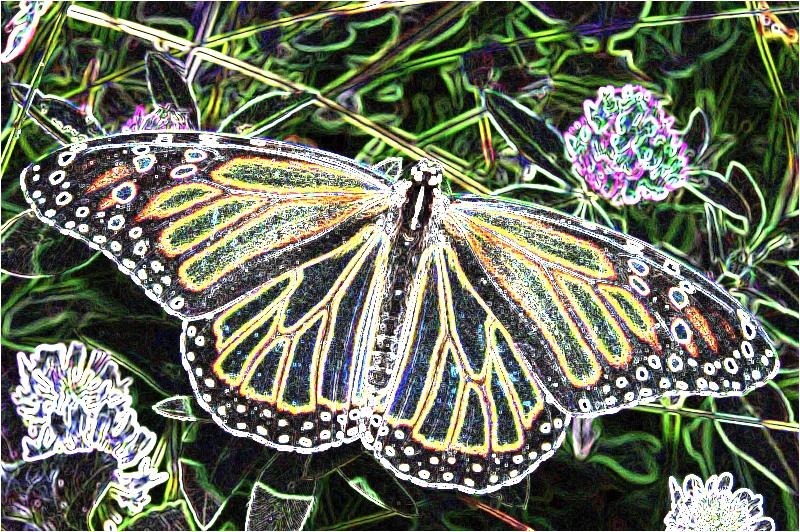 In the sample source code accompanying this article Gaussian image blurring is applied by invoking the ConvolutionFilter method. This method accepts a two dimensional array of type double representing the convolution matrix/kernel. This method is also capable of first converting source images to grayscale, which can be specified as a method parameter. 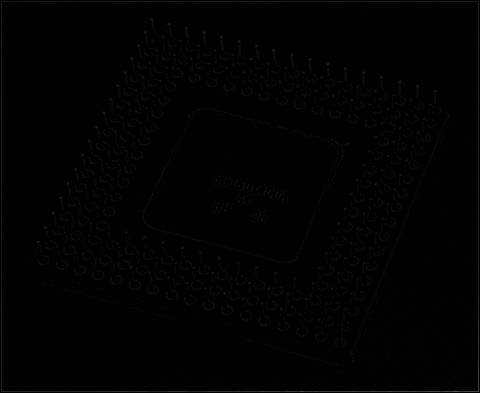 Resulting images sometimes tend to be very dark, which can be corrected by specifying a suitable bias value. The sample source code defines three Gaussian matrix/kernel values, a 3×3 matrix and two slightly different 5×5 matrices. The Gaussian3x3 matrix requires a factor of 1 / 16, the Gaussian5x5Type1 matrix a factor of 1 / 159 and the factor required by the Gaussian5x5Type2 equates to 1 / 256. When implementing the Difference of Gaussians method of edge detection after having applied two varying levels of Gaussian blurring the resulting images need to be subtracted. The sample source code associated with this article implements the SubtractImage extension method when subtracting images. The sample source code implements Difference of Gaussians edge detection by means of two extension methods: DifferenceOfGaussians3x5Type1 and DifferenceOfGaussians3x5Type2. Both methods are virtually identical, the only difference being the 5×5 Gaussian matrix being implemented. Both methods create two new images, each having a Gaussian blur of different levels of intensity applied. The two new images are subtracted in order to create a single resulting image. 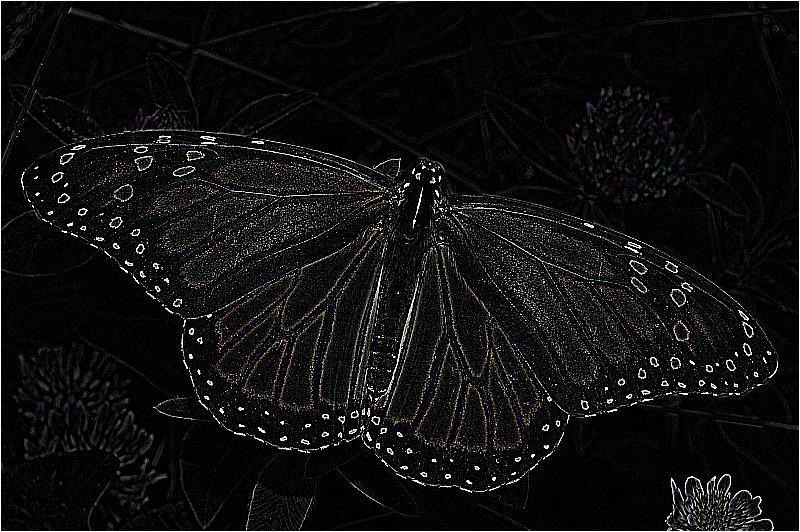 The objective of this article is to explore various edge detection algorithms. The types of edge detection discussed are: Laplacian, Laplacian of Gaussian, Sobel, Prewitt and Kirsch. All instances are implemented by means of Image Convolution. 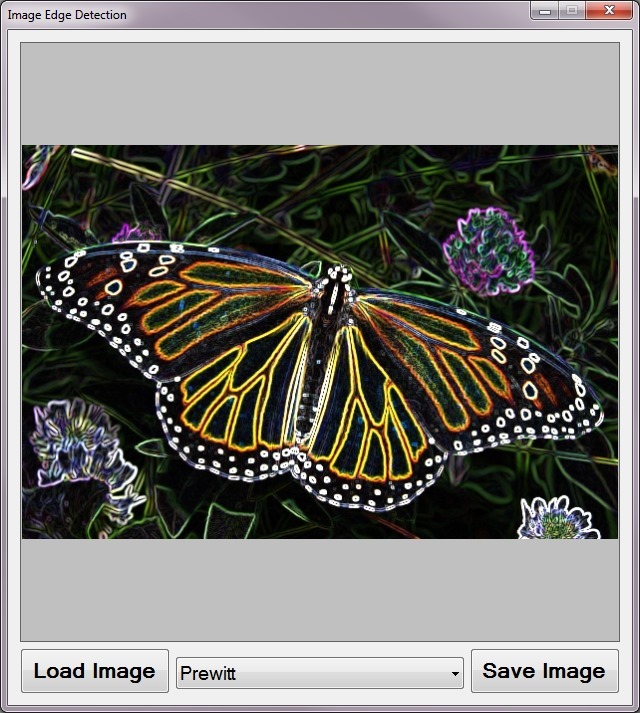 When using the Image Edge Detection sample application you can specify a input/source image by clicking the Load Image button. The dropdown combobox towards the bottom middle part of the screen relates the various edge detection methods discussed. 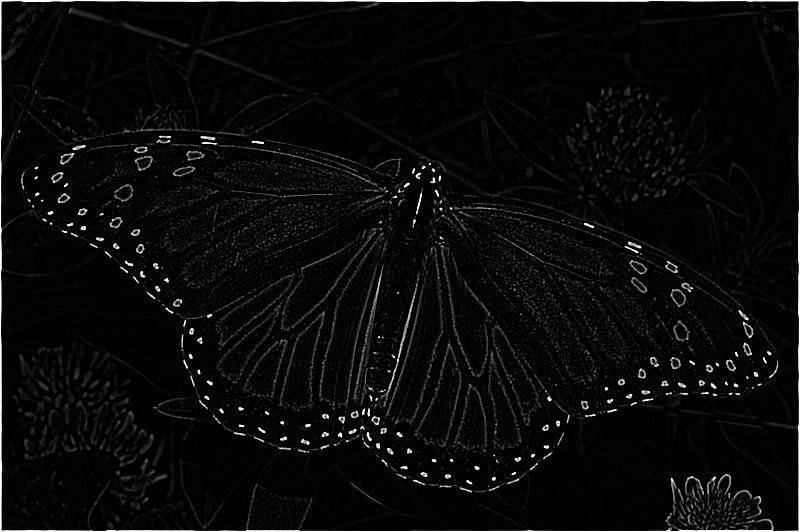 Edge detection is the name for a set of mathematical methods which aim at identifying points in a digital image at which the image brightness changes sharply or, more formally, has discontinuities. The points at which image brightness changes sharply are typically organized into a set of curved line segments termed edges. The same problem of finding discontinuities in 1D signals is known as step detection and the problem of finding signal discontinuities over time is known as change detection. 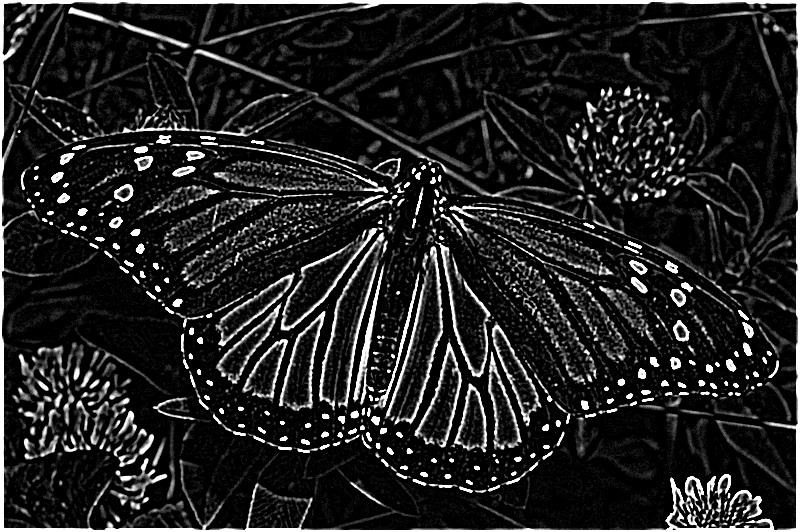 Edge detection is a fundamental tool in image processing, machine vision and computer vision, particularly in the areas of feature detection and feature extraction. Convolution is a simple mathematical operation which is fundamental to many common image processing operators. Convolution provides a way of `multiplying together’ two arrays of numbers, generally of different sizes, but of the same dimensionality, to produce a third array of numbers of the same dimensionality. This can be used in image processing to implement operators whose output pixel values are simple linear combinations of certain input pixel values. In an image processing context, one of the input arrays is normally just a graylevel image. 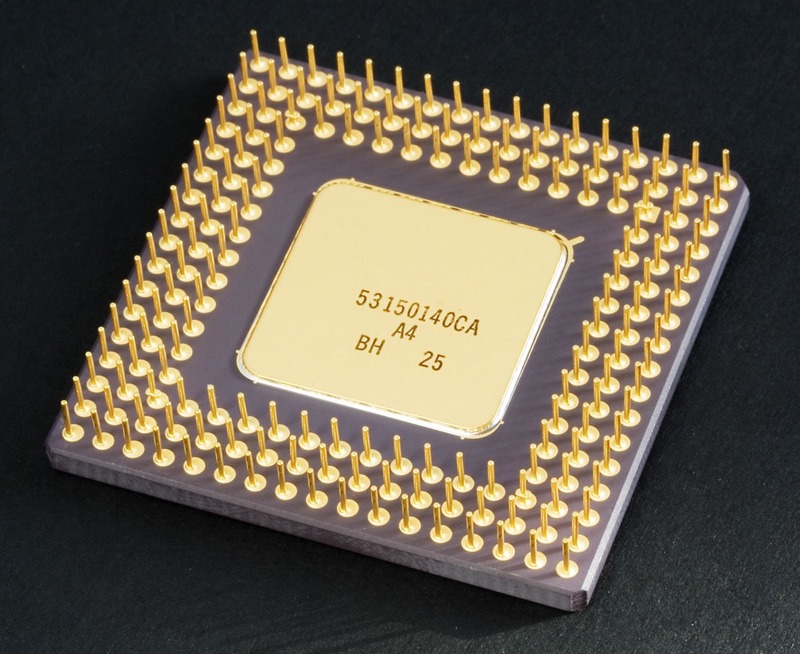 The second array is usually much smaller, and is also two-dimensional (although it may be just a single pixel thick), and is known as the kernel. The original source image used to create all of the edge detection sample images in this article has been licensed under the Creative Commons Attribution-Share Alike 3.0 Unported, 2.5 Generic, 2.0 Generic and 1.0 Generic license. 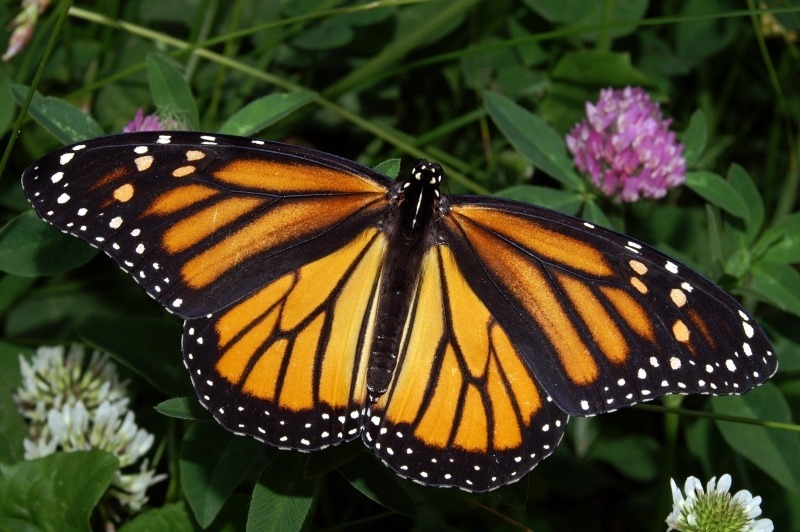 The original image is attributed to Kenneth Dwain Harrelson and can be downloaded from Wikipedia. Discrete Laplace operator is often used in image processing e.g. in edge detection and motion estimation applications. The discrete Laplacian is defined as the sum of the second derivatives Laplace operator Coordinate expressions and calculated as sum of differences over the nearest neighbours of the central pixel. A number of matrix/kernel variations may be applied with results ranging from slight to fairly pronounced. In the following sections of this article we explore two common matrix implementations, 3×3 and 5×5. When implementing a 3×3 Laplacian matrix you will notice little difference between colour and grayscale result images. 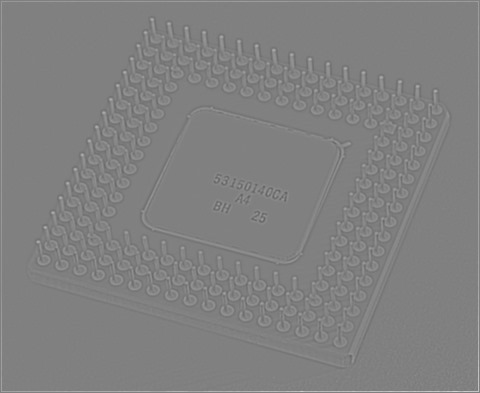 The 5×5 Laplacian matrix produces result images with a noticeable difference between colour and grayscale images. The detected edges are expressed in a fair amount of fine detail, although the Laplacian matrix has a tendency to be sensitive to image noise. The Laplacian of Gaussian (LoG) is a common variation of the Laplacian filter. Laplacian of Gaussian is intended to counter the noise sensitivity of the regular Laplacian filter. Laplacian of Gaussian attempts to remove image noise by implementing image smoothing by means of a Gaussian blur. In order to optimize performance we can calculate a single matrix representing a Gaussian blur and Laplacian matrix. Different matrix variations can be combined in an attempt to produce results best suited to the input image. In this case we first apply a 3×3 Gaussian blur followed by a 3×3 Laplacian filter. In this scenario we apply a variation of a 5×5 Gaussian blur followed by a 3×3 Laplacian filter. The following implementation is very similar to the previous implementation. Applying a variation of a 5×5 Gaussian blur results in slight differences. This variation of the Laplacian of Gaussian filter implements a 3×3 Gaussian blur, followed by a 5×5 Laplacian matrix. The resulting image appears significantly brighter when compared to a 3×3 Laplacian matrix. Implementing a larger Gaussian blur matrix results in a higher degree of image smoothing, equating to less image noise. The variation of Gaussian blur most applicable when implementing a Laplacian of Gaussian filter depends on image noise expressed by a source image. In this scenario the first variations (Type 1) appears to result in less image noise. The Sobel operator is used in image processing, particularly within edge detection algorithms. Technically, it is a discrete differentiation operator, computing an approximation of the gradient of the image intensity function. At each point in the image, the result of the Sobel operator is either the corresponding gradient vector or the norm of this vector. The Sobel operator is based on convolving the image with a small, separable, and integer valued filter in horizontal and vertical direction and is therefore relatively inexpensive in terms of computations. On the other hand, the gradient approximation that it produces is relatively crude, in particular for high frequency variations in the image. Unlike the Laplacian filters discussed earlier, Sobel filter results differ significantly when comparing colour and grayscale images. The Sobel filter tends to be less sensitive to image noise compared to the Laplacian filter. The detected edge lines are not as finely detailed/granular as the detected edge lines resulting from Laplacian filters. The Prewitt operator is used in image processing, particularly within edge detection algorithms. Technically, it is a discrete differentiation operator, computing an approximation of the gradient of the image intensity function. At each point in the image, the result of the Prewitt operator is either the corresponding gradient vector or the norm of this vector. The Prewitt operator is based on convolving the image with a small, separable, and integer valued filter in horizontal and vertical direction and is therefore relatively inexpensive in terms of computations. On the other hand, the gradient approximation which it produces is relatively crude, in particular for high frequency variations in the image. The Prewitt operator was developed by Judith M. S. Prewitt. In simple terms, the operator calculates the gradient of the image intensity at each point, giving the direction of the largest possible increase from light to dark and the rate of change in that direction. The result therefore shows how "abruptly" or "smoothly" the image changes at that point, and therefore how likely it is that that part of the image represents an edge, as well as how that edge is likely to be oriented. In practice, the magnitude (likelihood of an edge) calculation is more reliable and easier to interpret than the direction calculation. 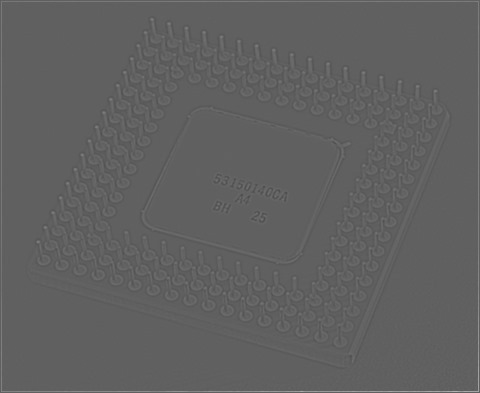 Similar to the Sobel filter, resulting images express a significant difference when comparing colour and grayscale images. The Kirsch edge detection method is often implemented in the form of Compass edge detection. In the following scenario we only implement two components: Horizontal and Vertical. Resulting images tend to have a high level of brightness.